1. Preheat oven to 375 degrees F. Lightly oil baking sheet. 2. Carefully remove husks from corn, reserving 4 largest husks. Lay corn ears on work space and cut off kernels. Process corn kernels until coarsely chopped (do not puree). Using slotted spoon, transfer corn mixture to small bowl. 3. Add cilantro, cornmeal, sugar and salt and process just to combine. Season with pepper and mix in bell pepper. 4. Arrange 2 corn husks on prepared baking sheet. Spread 1/4 of corn mixture (roughly matching size of halibut fillets) over each husk on sheet. 5. Season halibut on both sides with salt and pepper. Place over corn mixture. Top each with another 1/4 of corn mixture. Press remaining husk over. Cover tightly. 6. 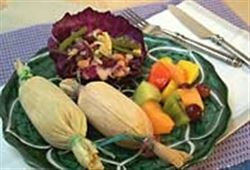 Cover both tamales with foil. Bake until halibut is just cooked through, about 20 minutes. Serve with warm flour tortillas. 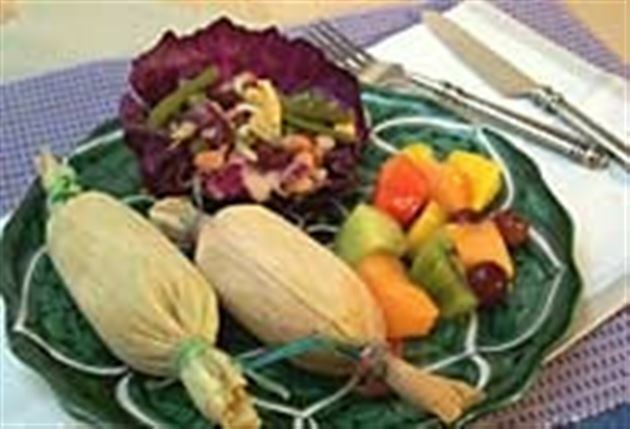 Enjoy this delicious tamales Mexican recipe!